Irises II - Van Gogh tapestry is based on the famous work by van Gogh from 1889. The original was painted in Saint-Remy, May 1889 which is now in the Paul Getty Museum in the USA. The impressionism that van Gogh created is unique and highlights the play of light and color. 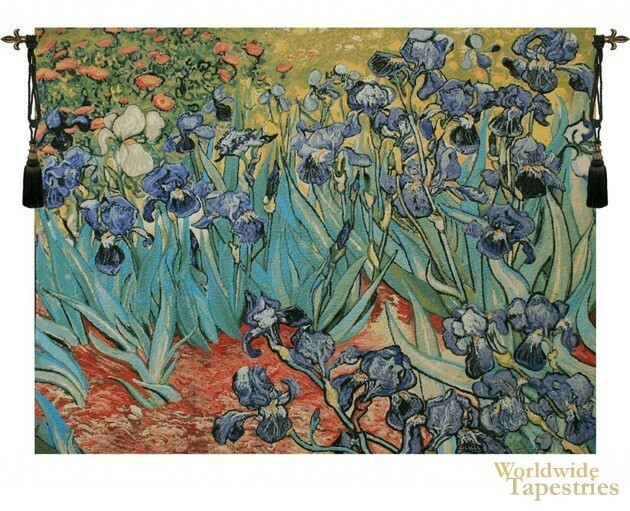 Here in this piece we see blue violet irises of the gardens which inspired many extraordinary works from van Gogh. Irises II - Van Gogh tapestry is backed with a lining and a tunnel for easy hanging. Note: tapestry rods and tassels, where pictured, are not included in the price. Dimensions: W 58" x H 52"